Honda Financial Services was established in 1987 to provide leasing and financing options for Honda motorcycles, ATVs, side-by-sides and power equipment through Honda dealers across Canada. HFS offers highly competitive interest rates and flexible payment options. Once you decide on your Honda model of choice, we want to make the next step of financing as simple as possible. That's why we typically deliver credit approvals at your Honda dealer in less than one hour - all for your convenience. If you should ever have any questions or concerns regarding your account or vehicle financing options, please feel free to contact us. At Honda, we strive to make everything about owning a ATV / side-by-side as fun and worry-free as possible. Once you've chosen your Honda, we want to make financing it as simple as possible. That's why we deliver financing approvals in less than one hour from the convenience of your local Honda dealership. As a finance customer, your payments will consist of part principal and part interest throughout the term of your finance contract. Each payment you make increases the amount of equity you've built up in your ATV / side-by-side, and the benefits to financing don’t end there. With the regular program, you can tailor your purchase to meet your monthly budget needs. Equal consecutive monthly payments are calculated using competitive interest rates and terms for 24 to 60 months, depending on the model chosen and amount to be financed. Once all of the payments are made, a zero balance remains and the ATV or side-by-side is yours. After making your payments for the duration of the financing contract, the ATV or side-by-side is all yours. So what comes next? Negotiating a trade-in with your dealer may be a great way to come up with a down payment for your next Honda. You can also sell your ATV or side-by-side privately or keep driving it for years to come - it's your decision to make. For more information about your options at the end of your finance contract, please contact our Customer Care Group toll free at 1-800-387-5399. Do I own the ATV? Once you have signed the financing terms and agreements, you can ride off the dealership lot as the registered owner of the ATV. With the regular finance program, you can tailor your purchase to reflect your monthly budget and needs. Equal consecutive monthly payments are calculated using competitive interest rates and terms from 24 to 60 months depending on the model chosen and amount to be financed. Once all of the payments have been made, a zero balance remains and you own the unit. Now, try our Finance Calculator to see which option suits your needs best. What are the benefits of financing my ATV? HFS offers highly competitive interest rates and flexible payment options. Once you have decided on your Honda model of choice, we want to make the next step of financing as simple as possible. That's why we deliver financing approvals in less than one hour, all right for your convenience within your Honda dealer. 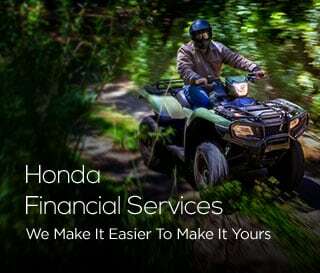 The Benefits The additional benefits of financing your Honda ATV with HFS are: All HFS retail loans are open ended and you may pay out, or make lump sum payments at any time without penalty. Flexible financing terms up to 60 months depending on the model and amount to be financed. We have highly trained staff to assist you with any inquiries you may have at any point of your Finance Agreement. Our customer service department offers convenient hours of operation and quality service. Do I have to insure the ATV? Provincial regulations stipulate that the ATV that is financed $10,000 or more must be insured. The required coverage is outlined in your financing agreement and will be detailed by your dealer representative. As the registered owner of the ATV, you are responsible for the maintenance of the unit. To get the most out of your ATV we strongly recommend that you follow the maintenance schedule as outlined in the Owner's Manual. Our dealers will be happy to ensure your ATV is serviced and runs at peak performance. Do I own my side-by-side? Once you have signed the financing terms and agreements, you can ride off the dealership lot as the registered owner of the side-by-side. Why should I finance my SXS with HFS, rather then using my line of credit? Do I have to insure my side-by-side? Provincial regulations stipulate that a SXS that is financed $10,000 or more must be insured. The required coverage is outlined in your financing agreement and will be detailed by your dealer representative. Am I responsible for maintenance on my side-by-side? As the registered owner of the side-by-side, you are responsible for the maintenance of the unit. To get the most out of your side-by-side we strongly recommend that you follow the maintenance schedule as outlined in the Owner's Manual. Our dealers will be happy to ensure your side-by-side is serviced and runs at peak performance. HCFI is committed to protecting the privacy of your personal information by complying with Canadian privacy laws and regulations.